Bob Norris was 70 when he was diagnosed with stage 2 lung cancer 14 years ago. A smoker since serving in the U.S. Army in the ‘50s, he quit as soon as he got the news. Feeling lucky to be alive after surgery and chemotherapy, he gently, “without nagging,” implored his beloved wife, Bonnie, and their only son to quit smoking, too. Three years later, in 2006, his wife learned she had stage 4 lung cancer. Four days after a party to celebrate their 50th wedding anniversary, Bonnie shared the tragic diagnosis. Norris himself survived a recurrence in 2011; this time a smaller tumor. His son Tony, then 54, took him for treatment. But within months, Tony was also diagnosed with lung cancer – stage 4. He finally took his dad’s advice to quit smoking, but after a five-month battle he succumbed to the disease. Since surviving cancer, Norris has dedicated much of his free time to raising awareness and funds for local and national cancer advocacy groups. The high school shop teacher from Maryland, who’d retired in 1989 and moved in 1994 to New Bern, North Carolina, at first raised money by recycling aluminum cans donated by local businesses. But after his story was publicized in the local paper, someone came during the night and stole all his cans. Discouraged, he gave that up. Then, at 80 years old, inspired by former President George H.W. 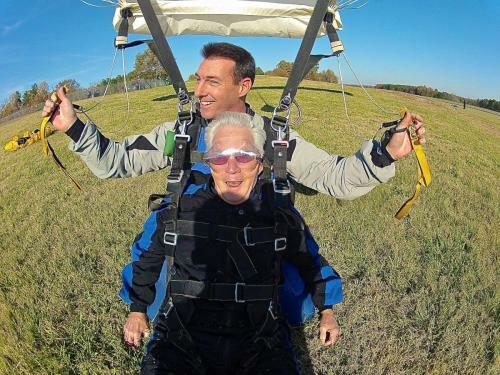 Bush, who’d skydived at age 90, Norris decided to go bigger than cans and take up skydiving — this time to benefit research at Duke Cancer Institute (DCI), where he, his wife and son were treated. Five years, and five jumps later, Norris estimates he’s raised nearly $6,000 skydiving for DCI. He advertises the event as a “bucket list” opportunity to “freefall for 60 seconds at 120 miles per hour” and “earn bragging rights for a lifetime” — all the while raising money for a cancer cure. There’s no stopping Norris. When he’s not skydiving, he can be found cruising around on “OlGezr” and “OlGezr 2” (his Yamaha street bike and Harley trike). Last summer he drove a stock car once wheeled by Jeff Gordon — 16 minutes around the Charlotte Motor Speedway at a top speed of 157 miles per hour. Next summer he plans to go zip-lining in the mountains. The grandfather-of-four and great-grandfather-of-eight also has a full social calendar — seeing family, dining out with his Good Grief Dinner Club of widows and widowers, hanging out with retired military friends or chatting up a storm at Toastmasters meetings. Visiting Duke for checkups with his oncologist Jeffrey Crawford, MD, bumping into his surgeon David H. Harpole, MD, in the hospital cafeteria, and meeting survivors like himself at Duke are also meaningful opportunities in which to connect. And even get a hug or two. Norris, who is also featured in the The Many Faces of Cancer photo essay, will skydive on Saturday, Nov. 4, 2017 at noon, at Triangle Skydiving Center in Louisburg, to benefit pediatric oncology research at Duke Cancer Institute. For more information on this year’s jump or to donate, visit Skydiving for Duke.